The contest concept is simple: Draw, paint, sculpt, carve or otherwise create your pumpkin art in the method that you’d like! Let your imagination run wild. · Pumpkin Art submissions will not be accepted without registration. · One submission per artist. If you have multiple children entering the contest, please fill out a separate submission form for each child. · The pumpkin art submitted must be your own work of art. That means that no adults can help to sculpt for children. · All entries must be received by 5pm on October 24th, 2012. Anything after the deadline can still be in the Pumpkin Illumination Trail, but not the contest. · Voting will begin on October 26th, 2012 and end at midnight on October 30th, 2012. Voting will take place online. The winners will be announced on Halloween at the Halloween Party on October 31st, 2012. The Halloween Bootacular Fair reserves the right to amend the information on this page… if we think of a way to make the contest better, or realize we said something stupid! We will not accept submissions of violent content, adult oriented content including inappropriate body parts, vulgar language or drug related content or references. We are sorry, but all contestants and guardians of contestants who are minors must comply with contest rules and festival policies. 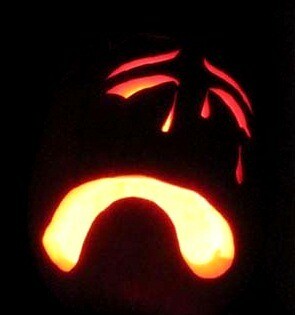 example: a large jack-o-lantern eating a small jack-o-lantern as he's screaming for his life!